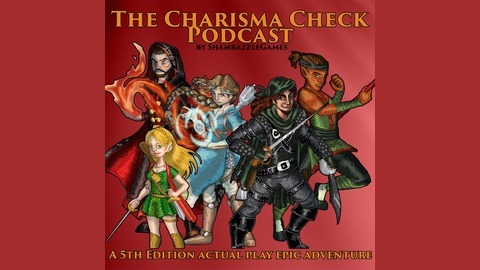 Charisma Check is a D&D Fifth Edition actual play podcast with a heavy narrative epic campaign focus. Five theatre performers deliver the best Dungeons & Dragons experience we can, with fully-voiced, interesting and likeable characters. If you're looking for an awesome epic adventure, or just want to learn how to play D&D, you'll find something here. A new day dawns over Elventree to mark our heroes’ safe return. The Harpers, the Council of Nine, her citizens and the Shadowvar now place their hope for safety with the Hand of the Harp. Meanwhile, the call of song and lyric presents a temptation that Chyna is not likely to ignore. With the Search for Faerun’s Brightest Star pending at the Talespinners Jamboree near the mercenary town of Yulash, they seek to support their determined… and persistent bard in her pursuit of a victory and the adoration of new fans. But the trade routes surrounding Hillsfar grow more treacherous for the companions, and even a simple journey to a neighbouring township should not be taken lightly. 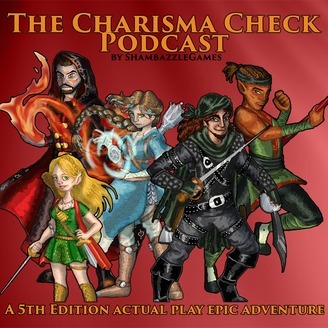 Hello and welcome to Charisma Check! A Fifth Edition (5e) Dungeons & Dragons actual play epic story! Five theatre performers bring their rich characters, fully-voiced and ready to share their love of D&D and epic collaborative story telling with you, our amazing community! *If you enjoyed the episode and want to see how the story of Chyna, Merkesh, Tamasin, Fa'en and Ranquess unfolds, please consider leaving us a 5-star review on iTunes and we'll read it out on the show! Our game focuses on fast-paced, story-focused narrative, with just the right amount of gameplay to help you feel like you're 'in the game' and (hopefully) learn more about how to play Dungeons & Dragons. Follow us on Twitter at: @ShambazzleGames and let us know what you think! We have an amazing community of new and veteran Tabletop and RPG players and dungeon masters on our Twitch Channel - ShambazzleGames - so whether you've played D&D for years or are experiencing it for the first time, there's something here for you! Music for Charisma Check provided by the incredibly talented Brandon and Derek Fiechter.